Coyotes resemble small collie-shepherd dogs with a bushy tail. They are related to dogs, wolves and foxes. On average, mature coyotes weigh from 30-40 pounds, with males at the larger end of the scale. They usually breed in February and March and den only when raising pups, otherwise, they sleep above ground. Photo courtesy of MD DNR. 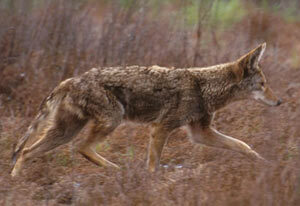 Coyotes (Canis lantrans) are a relatively new resident in our county, but sightings are becoming more commonplace. They were first noted in Maryland in the early 1970s and their populations have been growing and their range has been expanding ever since. Highly adaptable animals, the coyote tends to thrive when under pressure, whether from hunting or development. They are nocturnal and have a flexible diet, scavenging as well as hunting: it is their scavenging activity that leads them to become habituated to humans. They pose little threat to humans, however pets may be seen as prey. CCNRD is interesting in hearing about coyote sightings in the county. Please contact Senior Naturalist Andy Brown at 410-535-5327 or brownaj@co.cal.md.us. In 2013, a female coyote was killed in a collision with a vehicle near Flag Ponds Nature Park. Staff were able to salvage the animal and have it prepared by a taxidermist. 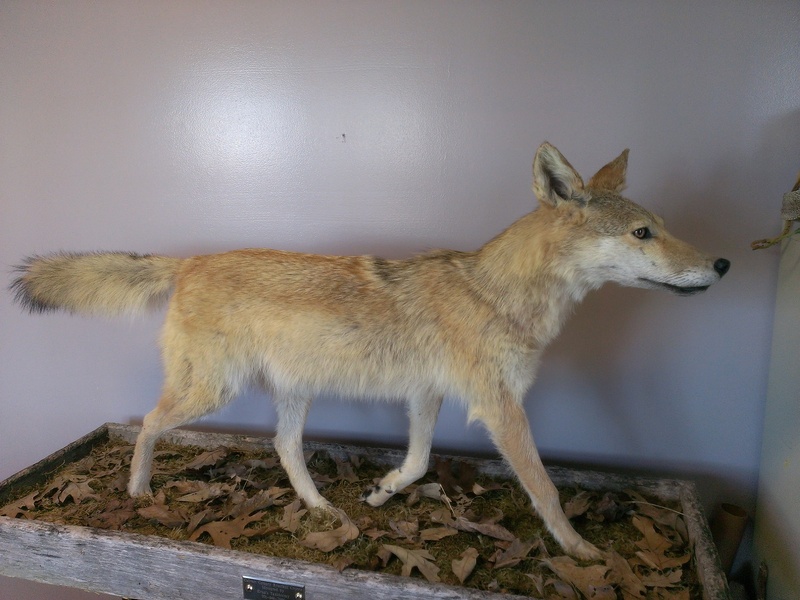 The coyote is on view in the Flag Ponds Visitor Center.